From the legendary editor who helped shape modern cookbook publishing-one of the food world's most admired figures-comes this evocative and inspiring memoir. Living in Paris after World War II, Jones broke free of bland American food and reveled in everyday French culinary delights. On returning to the States she published Julia Child's Mastering the Art of French Cooking. The rest is publishing and gastronomic history. A new world now opened up to Jones as she discovered, with her husband Evan, the delights of American food, publishing some of the premier culinary luminaries of the twentieth century: from Julia Child, James Beard, and M.F.K. Fisher to Claudia Roden, Edna Lewis, and Lidia Bastianich. Here also are fifty of Jones's favorite recipes collected over a lifetime of cooking-each with its own story and special tips. 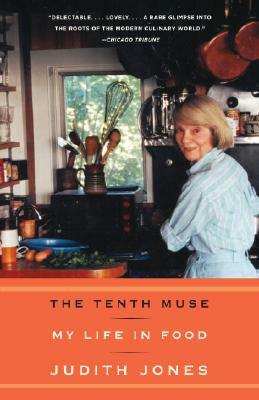 The Tenth Muse is an absolutely charming memoir by a woman who was present at the creation of the American food revolution and played a pivotal role in shaping it. Judith Jones is Senior Editor and Vice President at Alfred A. Knopf. She joined the company in 1957 as an editor working primarily on translations of French writers such as Albert Camus and Jean-Paul Sartre. She had worked before that for Doubleday, first in New York and then in Paris, where she was responsible for reading and recommending The Diary of Anne Frank. In addition to her literary authors, she has been particularly interested in developing a list of first-rate cookbook writers; her authors have included Julia Child (Judith published Julia's first book and was her editor ever after), Lidia Bastianich, James Beard, Marion Cunningham, Rosie Daley, Marcella Hazan, Madhur Jaffrey, Edna Lewis, Scott Peacock, Joan Nathan, Jacques Pépin, Claudia Roden, and Nina Simonds. She is the coauthor with Evan Jones (her late husband) of two books: The Book of Bread: Knead It, Punch It, Bake It! (for children); and The Book of New New England Cookery. She also collaborated with Angus Cameron on The L.L. Bean Game and Fish Cookbook. Recently, she has contributed to Vogue, Saveur, and Gourmet magazines. In 2006, she was awarded the James Beard Foundation Lifetime Achievement Award.